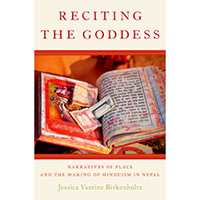 University of Illinois religion professor Jessica Vantine Birkenholtz writes about one of Nepal’s best-known Hindu narratives in her new book, “Reciting the Goddess: Narratives of Place and the Making of Hinduism in Nepal.” Birkenholtz uses the narrative to look at the evolution of Hinduism in Nepal, the country’s sense of place in the region and the history of its social, linguistic and literary cultures. CHAMPAIGN, Ill. — In one of Nepal’s best-known Hindu narratives, the young daughter of a devout couple was cursed by the god Shiva to marry a man 10 times her age. Pregnant and widowed soon after she’s married, the girl lived a life of poverty until the gods taught her to perform the vow to the goddess Svasthani. Her fortunes soon changed when her son was crowned king. 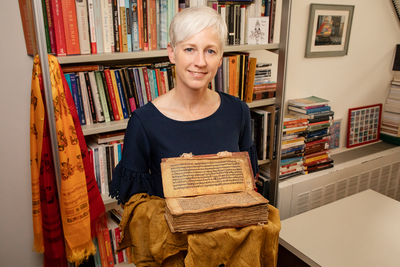 The development of the narrative, which originated in the 16th century and became a primary religious sourcebook to Hindus in Nepal, can tell us not only about the evolution of Hinduism there, but also about the country’s political history and sense of place, changes in language and literary tradition, and the representation of women in the culture, said University of Illinois professor of religion Jessica Vantine Birkenholtz. Birkenholtz has written the first critical study of the Hindu narrative tradition, called the Svasthanivratakatha – SVK for short – and of its patron goddess Svasthani. 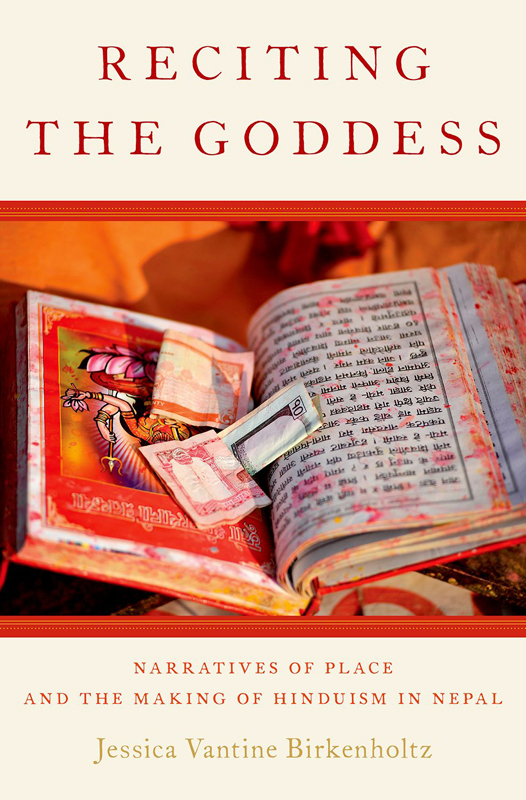 Her book “Reciting the Goddess: Narratives of Place and the Making of Hinduism in Nepal” was published by Oxford University Press this spring. The story started as a local legend, little-known outside of Nepal (which is still the case today), and early versions of it were told in handwritten manuscripts in the Newar language of the indigenous people of the Kathmandu Valley. During the course of her research, Birkenholtz examined 125 manuscripts of the Hindu narrative in various archives in Nepal, as well as about two dozen handwritten texts in use in households in Sankhu, a village on the outskirts of Kathmandu where she conducted ethnographic fieldwork. 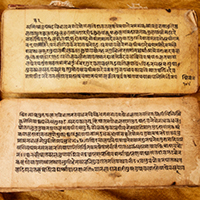 This manuscript is written in the Newar language and dates to 1830. Birkenholtz was surprised to find it among many curios for sale from a street seller in Kathmandu. 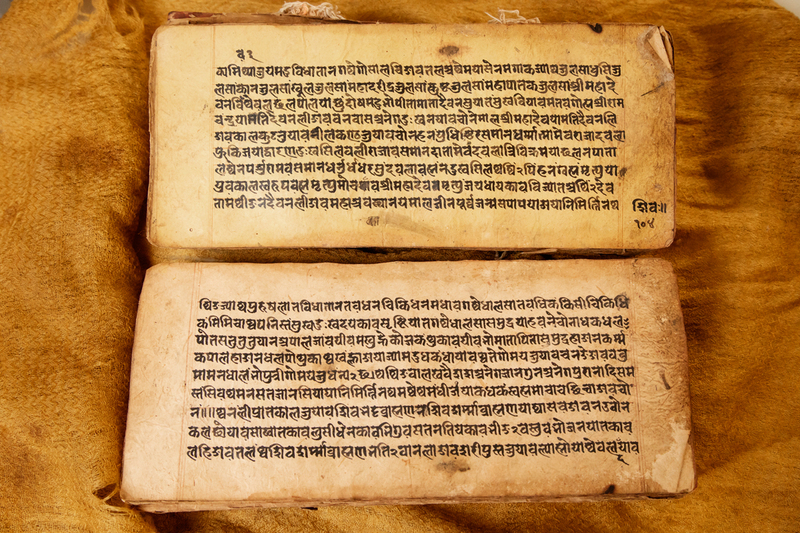 In the 18th century, the SVK narrative began to change and incorporate stories from the larger, more orthodox Hindu tradition, including creation narratives and other stories and myths about pan-Indic deities derived from ancient Sanskrit texts. The changes can be seen as a reflection of the growing sense of place of Nepal and of it being a sacred region, Birkenholtz said. The Hindu rulers of Nepal were trying to project an image of the country as a pure Hindu land, in contrast to India, which had been twice colonized by foreigners, she said. The narrative has become a critical source of Nepali Hindu identity. There are a decreasing number of people left in Nepal who can read or write the Classical Newar language and script in which the SVK was historically written. The modern, expanded SVK narrative is printed in the Nepali language and represents a homogenous, streamlined version of the tradition. Handwritten Newar SVK texts, in contrast, have always varied more widely. They all contained the same core myth, but Newar versions were never standardized and may include one or more of a series of different stories that were never taken up by Nepali-language SVKs, Birkenholtz said. 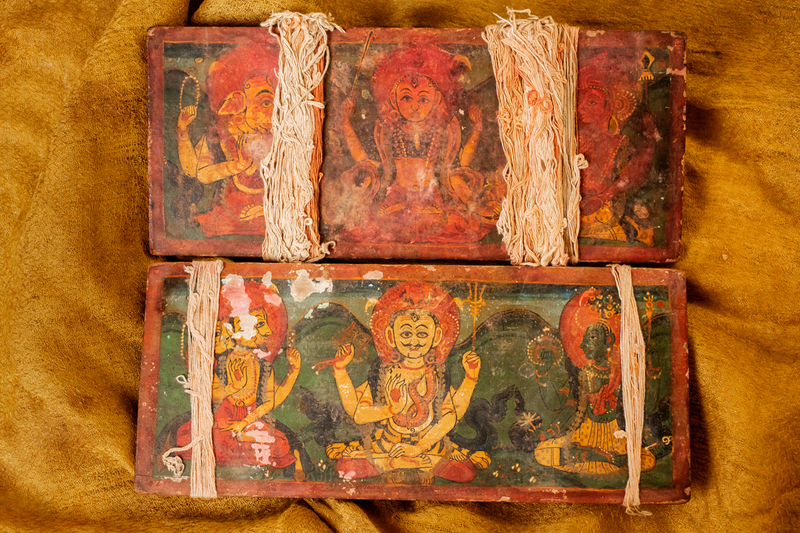 The inside covers of Birkenholtz’s 1830 Hindu manuscript features rare colorful artwork of the goddess Svasthani (top middle) and the great god Shiva (bottom middle). 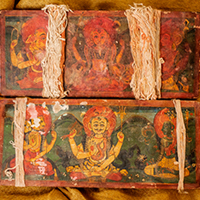 Birkenholtz plans to eventually donate the text to one of Nepal’s archival collections. The modern narrative is divided into 31 chapters. Historically, families read the story during the month between full moons in January and February, covering a portion of the story each night. As with many Hindu rituals, the stories and the ritual vows devotees may also choose to perform over the month’s duration are geared toward women, who are seen as the spiritual caretakers for their families. Although it is a woman’s tradition, it is patriarchal in ideology in that it perpetuates some ideals such as child marriage and reinforces the subordinate position of women in Hindu society, Birkenholtz said. The late 19th- and early 20th-century anti-colonialism movement in India included a women’s movement that broadened the nature of Hindu womanhood there, Birkenholtz said. In contrast, current narrative additions to the SVK text reveals a hardening of conservative ideals and patriarchal ideology in Nepal, consistent with Nepal’s rulers’ conservative, isolationist policies of the time, she said. Some Nepalis are increasingly objecting to the patriarchal nature of the tradition, although many Nepali women continue to find the text empowering, particularly those in more rural areas, Birkenholtz said. Her next project is an article on contemporary Nepali Hindu women’s responses to the tradition. Birkenholtz is also working on the first English translation of the full, modern SVK. Editor’s note: To reach Jessica Birkenholtz, email jvanbirk@illinois.edu.